Finesse Fireplaces is a small family run business that specialises in hand crafting natural Bath limestone fireplaces, using traditional methods. The company is proud of its history, where the age-old and intricate skill of stonemasonry has been passed down through the family over five generations. Each individual stone is hand carved by master stonemason and business proprietor Neil Gray, at the company workshops located just outside bath; ensuring the highest standard of quality, to give grace, warmth and elegance to your home. 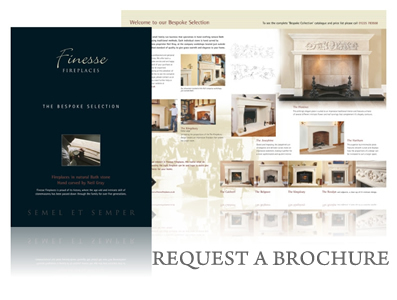 Finesse Fireplaces ensure a professional and personal service is provided at all times. I offer both a made to measure and bespoke service and I am happy to offer advice on any aspect of your purchase at any time. Site visits can also be organised. I hope you enjoy looking through my collection, which not only shows you the many designs available, but also talks you through the various stages involved such as site surveys, installation, delivery and the bespoke service I offer. Please see the service page for details. A frequently asked questions page is also featured but please do not hesitate to contact me on 01225 783558 should you need further help or advice. You can also email me by clicking here. Thank you for taking an interest in Finesse Fireplaces. I realise what an important decision choosing the right fireplace can be and hope to assist in making the right choice for your home. Be careful when choosing your stonemason to carve your fireplace. The quality is vastly variable. If you have any doubts you must see the quality of their work first. I personally carve every fireplace and I have carved over 2500. I don’t take deposits, so you have every confidence in getting a perfect quality, high end product from Finesse Fireplaces.